Today for #SundaySupper we are to make a lighten up dish for the holidays. When I think of lightening up the holidays, besides vegetable dishes I think of dessert. One of my favorite desserts to have on Thanksgiving is pumpkin cheesecake. Oh man I could just eat and eat it! So today I thought I would take one of my all time favorite desserts and turn it into a low-calorie dip. 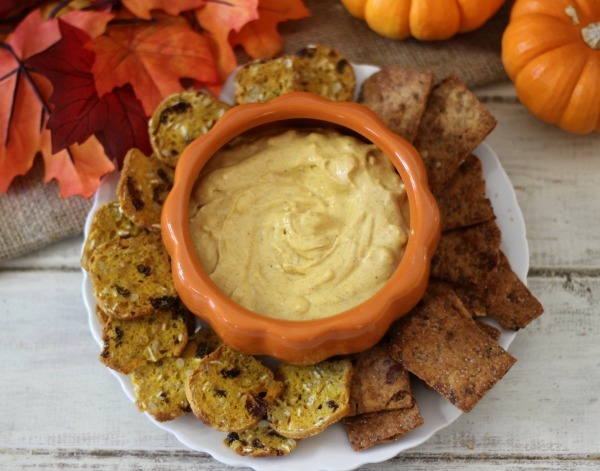 As you may know this is my Pumpkin Cheesecake Dip. This dip is incredible. 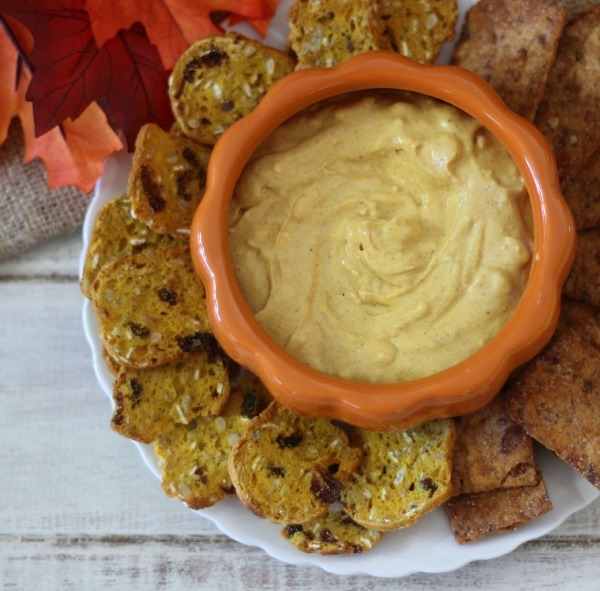 It’s creamy, light, and loaded with pumpkin flavor. I even used maple syrup to sweetened it up. I love maple syrup with pumpkin. When making this dip, a lot of it disappeared before I could take photos. Jenny had some on a muffin, then she added it to her bagel. She said can I have it all. Yes it’s in the fridge. I had to be sure to get my pictures in before it vanished in front of my eyes. I guess we can say this is a hit. Making the dip is so easy. I just used reduced fat cream cheese, pumpkin, maple syrup and cinnamon, cloves and nutmeg and beat it all together. 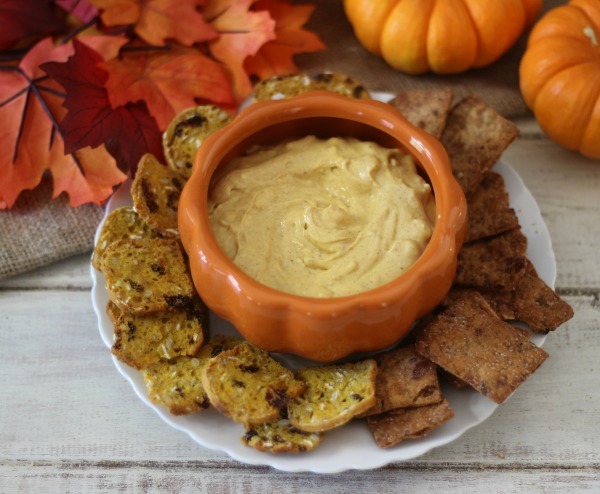 I served it with Trader Joe’s pumpkin pita chips and pumpkin crisps. It’s so easy and makes for a great little treat to have at your next holiday party. In a mixing bowl, add all of the ingredients and beat until creamy smooth. You will have to scrap down the sides of the bowl periodically. I just love the holidays, well I think I just love dessert! 🙂 Now be sure to check out what other lightened up goodies the #SundaySupper crew made. Oh, boy, does this look terrific! 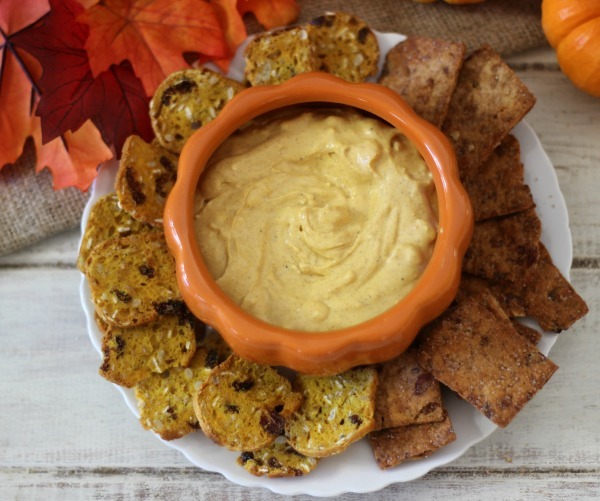 Perfect on Thanksgiving or for any autumn gathering! Looove this dip! I’m making some today! I know it’s so tasty isn’t it? Okay, now that is my bowl, I am not sure what everyone else is going to eat!! Looks great!! Oh wow this looks way too good! I would probably want to eat the whole thing too, especially with those crips from TJ’s I love both fo the types you have! Hi Shelby! I agree the crisps and Pita Chips from TJ’s are my favorite and go great with the cheesecake dip. This would be great for bringing to my next MNO! This looks amazing, Jen! I love quick little recipes like this — so easy to whip up for last-minute guests or party invites. OohhhEeemmmmGeee I need this dip ASAP!! I love it Jen! Thank you so much Bobbi! It’s really good! I couldn’t even get to photograph it all because people kept eating it. Pumpkin cheesecake is my favorite thing about my family’s Thanksgiving dinner. Having it as a healthier dip version sounds perfect! Oooh, this looks fantastic! Thanks for sharing! This probably sounds silly, but I don’t think I’ve ever had a dessert dip! Time to change this; I love pumpkin desserts in November and yours looks fabulous! You need to make dessert dip! So fun and easy! Plus tasty too! YUMMY!!!!! I love a good dip, and this is calling my name! 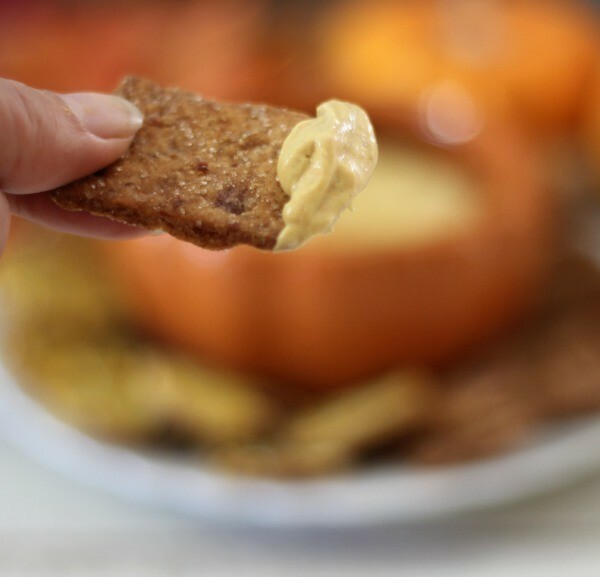 I love pumpkin cheesecake.I need to try this dip!